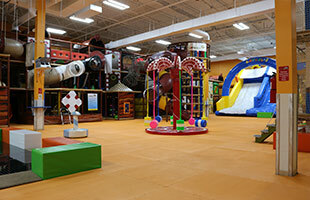 Let’s Play is an indoor soft play center for children aged 0-12 years, based in Birmingham, Alabama. We’ve created a kid-friendly indoor environment that is stimulating and enjoyable for your kids. Children enjoy the adventures of our pirate ship themed soft play structure, shoot foam balls at various targets in our cannon area, have a blast climbing their way to the top of our spider web tower and conquer our multi-level and one of a kind obstacle net-course. Every activity is unique and helps with different muscles of the body to exercise, maintain orientation, flexibility and agility. All activities are created and appointed based on the age of the children, egronomical and other safety requirements. For the babies or children under 4, there is a specific area to enjoy, with activities that engage their senses, body and mind. They have their own ball pond, mini slide, balloon house and play equipment. We also cater for children’s birthday parties, taking the strain out of the special day. We pride ourselves in giving you and your children the best party experience you will ever have; we go that extra special bit to make the parties fun and unforgettable for everyone involved. We cater not only for Birthday parties, but for all your celebrations. We have various packages available including the option of private parties. Let’s Play concept was designed as a result of many children led visits to other centers, some of which offered unmemorable experiences from limited play facilities for children and indifferent catering for parents. As a result we were determined to invest heavily in providing relaxed and clean play centers that offer stimulating and enjoyable activities for children from 0-12 years old. At Let’s Play, we recognize that keeping children active plays a key role in promoting physical and mental well-being to growing children, and this, coupled with parents increasing concern about allowing children to play unsupervised, has stimulated the development of Let’s Play. Our play areas are packed with fun and adventurous activities for children, with a welcoming, quality environment for parents to enjoy watching their children develop their skills at play. Let’s Play offers a great play value to promote physical activity and encourage exercise in a controlled and safe environment. All our play equipment is designed to encourage physical activities including – sliding, crawling, balancing, swinging, bouncing, squeezing, hand eye coordination, ball skills, etc. everything a developing child would expect to experience at play. Let’s Play prides itself in providing a safe and clean environment for your children. We have gated entry/exit system and plenty of seating to give you good line of sight to allow interaction with your children and access to view the play structure at all times. We require everyone including adults to wear socks in our play area for health and safety reasons. We offer socks for sale in case you forget to bring them.